Yesterday I received an email from Stacey Turner, Owner and Managing Editor of Angelic Knight Press. Angelic Knight Press is being acquired by a larger publisher and some titles from will not be carried over into the new imprint--Manifesto: UF is one of those titles. On December 1, 2014, Stacey will be removing Manifesto: UF from online distributors. All of this is normal and good and as it should be. My progress on Cygnet Moon has been periodically interrupted by short stories all year so I'll be taking a brief hiatus on the short story front in order to finish the novel. I will be around, because I've promised folks some interviews and blog posts, and I will be cross-posting those events here. Otherwise, things are going to be kind of quiet here at the old blog. The last couple of weeks have just blown me away by the number of people who have said such nice things about Miserere and Manifesto: UF. Justin Landon gave a super shout-out to Miserere over at Tor.com in Under the Radar and calls Miserere "... one of the most grossly under-read novels of the last few years." This was another story, whose title was attention-grabbing, plus it was written by Teresa Frohock and so I was assured of two things; elegant prose and dark settings. Not only does the author do her best in creating a rich, dark atmosphere but she also goes about creating admirable characters who leave you hooked onto the story. Another fine dark gem from an author who is fast becoming a solid favorite of mine. "Another fine dark gem ..." will be going on my novel web page soon. Meanwhile, go read Mihir's review and see what he has to say about all the other great stories in Manifesto. I got a Friday night suprise from Matt Gilliard when he reviewed Miserere at his blog, 52 Book Reviews. What was so interesting about this review was the Gender Bias in SF/F Roundtable discussion that led up to Matt's decision to read more novels written by women. Authors Stina Leicht, Zachary Jernigan, and Mazarkis Williams joined Matt for a discussion of women in SF/F, and they provided some interesting thoughts on the subject. And finally, I watched a movie recently that I would really like to share with you. Later on, when I've got more time, I'll write a full review, but for now, if you are looking for a dark and delicious fairy tale, watch the movie Blancanieves. The entire film is a tribute to silent movies and Pablo Berger treats his subject with great love. The idea of Snow White as a bullfighter made me laugh until I saw the performances in this film. The acting is subtle and glorious. Maribel Verdú, who is fast becoming one of my favorite actresses, plays the wicked stepmother to evil perfection. The coolest twist comes in Carmen/Blancanieve's desire, which is not to become a dancer like her mother, but to become a renowned bullfighter like her father. Set in Andalusia in the 1920s, the movie captures the romance of the period and brings it to life in black and white. Blancanieves is dark and luscious and made with love so go on and take a bite of that apple. You won't regret it. Not at all. An exclusive excerpt from "Love, Crystal and Stone"
As many of you know, I sold a short story to the Neverland’s Library Fantasy Anthology recently. The story, “Love, Crystal and Stone,” is a companion piece to my short story “Naked the Night Sings,” which appears in Manifesto: UF. Although they’re sister stories, they are as different as night and day in tone. When I found out that Tad Williams had written the introduction to Neverland's Library Fantasy Anthology, I had a real fangirl moment and wanted to write something special. Short stories are fun because I can experiment with different techniques and styles without the time investment required by a novel. That is what I did with "Love, Crystal and Stone." Whereas “Naked the Night Sings” has an urban fantasy/horror vibe, “Love, Crystal and Stone” is more of a traditional fantasy story. The story unwinds at a more leisurely pace and is a much more personal story to me. I'll talk about why in some future posts. The theme of rediscovery was very interesting to me, and I considered it carefully before I began writing. One important aspect of rediscovery is that in order to rediscover a thing or a person, one must first experience loss. While I'm letting a short story percolate, I've returned to work on Cygnet Moon. I don't have any taglines or blurbs for this novel yet, but I am thoroughly enjoying the story. The protagonist has finally begun to show me a few moments of subtle psychological imbalance. That trait has prevented the story from slipping into the tired old frame "young person goes into the world to mature." With the suffocating whiteness of her ar’nel gone, I could breathe freely once more. My eyes still burned and refused to focus properly, but I glimpsed the shadowy image of Balian as she stepped close to Mother’s side. I've also been working on some guest posts that will be showing up online over the next few days and weeks. I'll keep you notified of when those go live. I'm over at the Ranting Dragon, making a case for Marion Zimmer Bradley's novel The Mists of Avalon as my choice for their Great Fantasy Novel series. Tomorrow, my big post of the week will be at BookSworn. I'm really excited about the Manifesto: UF anthology that is coming September 1. I've had a chance to read several of the stories and I love the way that Tim and Tyson have segued from one story to the next. There is a definite flow to the anthology that makes reading the stories in order very smooth. One thing I've loved about the various stories that I've read so far is the scope of urban fantasy. Manifesto: UF has a little something for everyone. I'll be talking more about my story, "Naked the Night Sings," over at Suzanne Johnson's blog later in September. Suzanne is an agent-mate of mine, we're both represented by Marlene Stringer. You can read about Suzanne's urban fantasy novels right here. While I worked on "Naked the Night Sings," I thought a lot about the fine line between urban fantasy and horror. Of course, we all know what happens when I start to think--either nothing good comes of it, or I end up writing an ungodly long blog post about it. So that is what has been going on behind the scenes. I hope you've been busy too. ... Or a very teeny update. In the month of May, I completed two different short stories, "Naked the Night Sings," which will appear in the Manifesto: UF Anthology published by Angelic Knight Press (coming in September 2013), and a new story "Love, Crystal and Stone," which I intend to submit for consideration in the Neverland's Library Anthology. 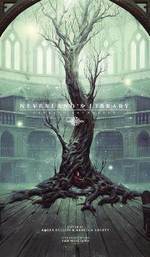 Neverland's Library Anthology is winding into the final hours of its crowdfunding drive, so go right here to help fund this anthology. They have a super line-up of authors who are confirmed participants in the anthology, and none other than Tad Williams will be writing the introduction. Just so that you know I'm not slacking off here: between these two stories, I wrote approximately 11,900 words, which is about one-quarter of a novel. Also in May, I finished reading the very well-written Heir of Night by Helen Lowe. I am working on a review for you. I will be posting at BookSworn later this week with a never-before-seen-authentic-hand-drawn map of Woerld, drawn by ... ahem ... none other than me. I have several other things in the works, but if I fall silent again, then it's because I've returned to work on my new novel Cygnet Moon. And that is all that I have for you right now. Stay tuned, I'll keep you posted. Meanwhile, watch for me ... I'll be around.